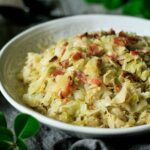 Southern fried cabbage with bacon is a keto side dish that’s low carb and simple to make. Bacon is added to make this deep South soul food extra yummy. Reap the health benefits of eating low calorie cabbage with your meals. Enjoy eating this country cooking comfort food with your family tonight. 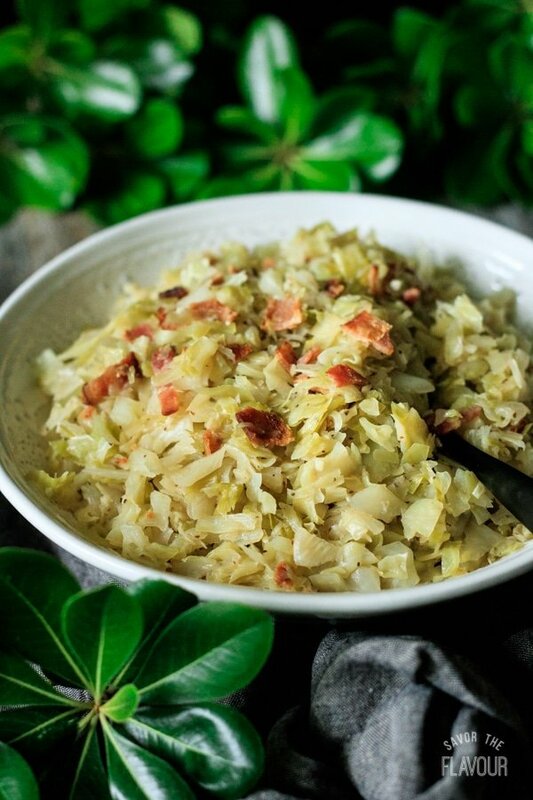 Southern fried cabbage with bacon is a Southern classic side dish and one of busy Baker’s favorites. Cabbage is so good for you. It’s low in calories, too, so if you’re trying to loose weight, eat plenty of it. 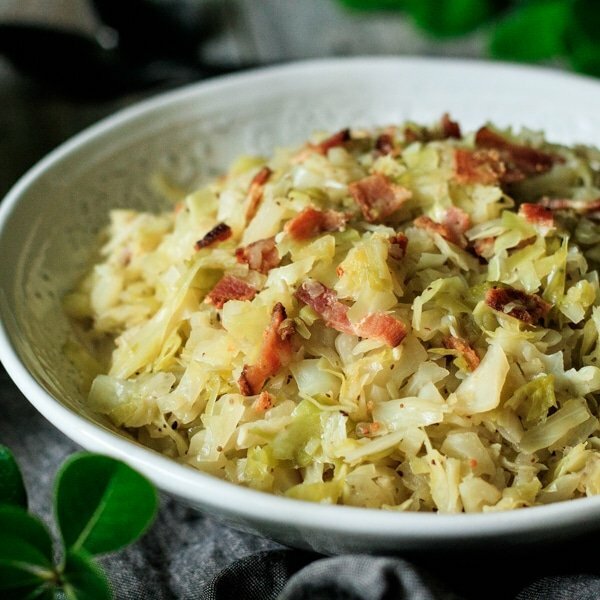 This version of fried cabbage adds the vinegar, sugar, and salt at the very end, which helps control the salt content. I’ve used a white wine vinegar, but if you’re a apple cider vinegar fan, feel free to substitute. My recipe is very mild, due to a houseful of girls who prefer the milder side, but if you like your cabbage a bit more spicy add red pepper flakes or a dash of hot sauce. If you are trying to eat healthier, you can replace the bacon fat with olive oil, and the salt can be added after the bacon bits are to reduce the sodium level. 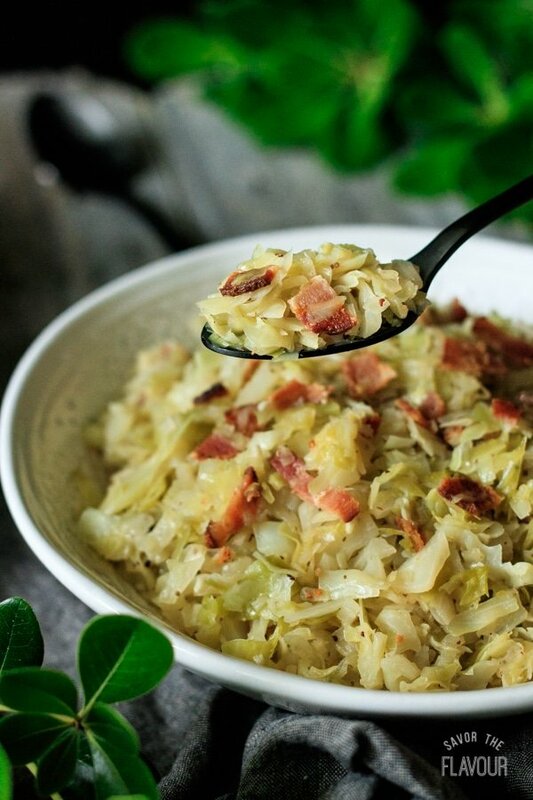 You will enjoy eating a big helping of southern fried cabbage with your dinner tonight. Serve it along side our chicken and dumplings, buttermilk biscuits, and sweet tea. Looking for more Southern side dishes? We’ve got you covered. Black-Eyed Peas: a meaty side dish full of fiber and flavor. Sweet and Smoky Baked Beans: these baked beans are sure to be a hit at potlucks and BBQs. In a large cast iron skillet, cook the bacon over medium heat. Use a fork to flip it over. Drain on paper towels. Once cooled, cut into bite sized pieces and set aside. Pour all the bacon fat into a small bowl. Reserve two tablespoons of bacon grease to put back into the skillet. Put the bowl of bacon grease in the fridge to harden, then discard. While the bacon is cooking, chop the onion and mince the garlic. Saute the onion in the skillet for 5 minutes, then add the garlic and cook until fragrant. Add the caraway and celery seed. Over medium high heat, add the chopped cabbage a little at a time. Stir until the onion-garlic mixture is well incorporated with the cabbage. Cover and cook for 15 minutes, stirring every 5 minutes. During the last 5 minutes of cooking, add the vinegar, sugar, and salt. Stir well. Reserve some of the bacon for garnish. Stir the rest of the bacon into the cabbage. 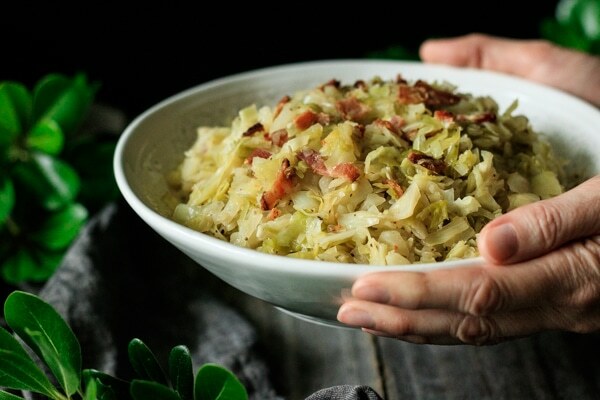 Transfer the fried cabbage into a serving bowl and sprinkle some bacon on top. Serve warm.